What is it? It's an upcoming downloadable game in which you "see" the world as a blind girl who is searching for her cat. How exactly does that work? You're this 10-year-old girl Rae, and you walk around, sensing the world through what you can touch and hear. It's not just a matter of having the world gradually get drawn in as you walk through it, though. In this first clip, she can hear the stream (which is why you can see it), but she doesn't know that there's a bridge there until she touches part of it. That changes what the game shows. Isn't this kind of like The Unfinished Swan? Slightly. OK. Who is making it? It's coming out under the Team 17 label. Those are the Worms people, but this game actually began as a solo student project by a Dutch game designer named Sherida Halatoe. She's now working with Team 17 on this more polished version of her game. Did we play it? Just for a few minutes at an Xbox One indie game showcase wayyyy back in early March. The developers were a little nervous about giving us the controller because they hadn't smoothed out some collision issues, but it pretty much played fine. Got a fun detail? Of course! Halatoe said that the first time she submitted it as a school project she failed. Something about her trying to do too many things at once. She worked on it some more and successfully got through her game design studies. Is there more to it than just walking around? There were some basic environmental puzzles in terms of figuring out how to get around. And there is a fear mechanic of some sort that you can see in the second clip. Really, though, it's cool enough just as a way to demonstrate how a blind person might learn about their surroundings. What's it on, when's it out? Xbox One and PC some time this year, according to all the official info. 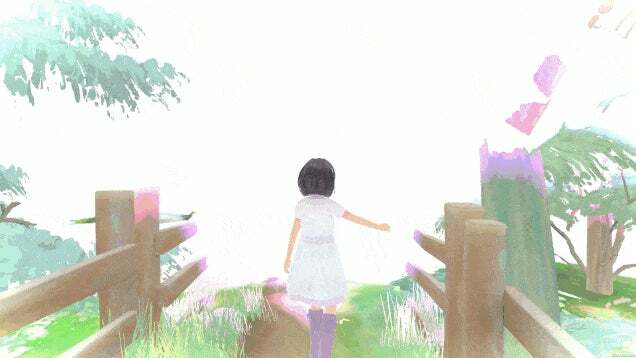 Follow the official Beyond Eyes Twitter feed to keep up. Interesting. Reminds me of a sweet animated short from a while back called Out of Sight.